Chinese fans considered her flag unfurling a political act. With anger over territorial and political disputes reaching fever pitch across East Asia, even the most benign acts can trigger an outpouring of nationalistic vitriol. 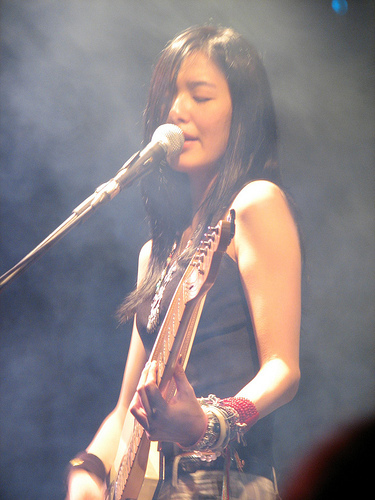 One popular singer-songwriter from Taiwan has been sucked into the cross-strait row between her homeland and China after holding up the red, white and blue ROC flag at a concert in the U.K.
Desert Chang, known in mainland China as Zhang Xuan, is popular in Taiwan, China and Singapore as an indie folk rocker. In April, the 32-year-old musician won the Best Lyricist award at the 2013 Top Chinese Music Awards for a song called “Rose-Colored Glasses” – a piece with political and social undertones that “discusses how people deliberately ignore the plights of marginalized groups, such as ‘Free Tibet’ demonstrators, homosexual couples, Malmo protesters, pro-democracy advocates, and anti-nuclear power activists.” Chang also received the Best Producer Award and the Best Singer-Writer Award at the same event. Last weekend, Chang performed at a small concert hosted by the University of Manchester that was attended by mostly Chinese and Taiwanese students. After noticing an audience member in the front row who was holding an ROC flag, Chang approached the fan and brought the flag on stage. Chang fired back: “It's not politics, it is just a flag that represents where I am from.” She added that Chinese fans were free to express their opinions to her. Although the concert continued without any further outbursts, the backlash across Chinese social media was severe. Many users in the mainland called on event organizers to cancel Chang’s upcoming Chinese concert tour, with some suggesting that she stay out of China entirely. Still others demanded that Chang retire from the entertainment industry altogether. “Only a singer with a brain full of excrement would talk about such sensitive topic on stage… before you defend your own political stance, you should consider others’ feelings,” read one Facebook post to Chang’s page. “Don’t think just because you flash a flag that makes you a country. [Taiwan] is destined to be stepped on by China,” wrote a Weibo user. The Taiwan’s Mainland Affairs Office asked for mutual understanding from both sides of the strait, urging young people to “be good friends” regardless of what side they live on. “We hope the Chinese side will refrain from politicizing this incident or subject Ms. Chang to any unfair treatment,” said Wang Yu-Chi, the office’s head. A Chinese spokesperson from the Taiwan Affairs Office, the Mainland Affairs Office’s counterpart, would neither confirm nor deny rumors that Chang’s upcoming concerts had been cancelled. Taiwan's Mainland Affairs Council Minister Wang Yu-chi will travel to China to meet with his counterpart, Zhang Zhijun.